Upgrade the worn-out carpeting in your master bedroom or anywhere else in your house when you visit our well-stocked carpet store. Carpet flooring from our professionals gives a timeless look and cozy home feel for your family and guests to enjoy for years to come. We have made a name for ourselves, thanks to our ability to offer customers choices from our impressive flooring collections in an unlimited variety of colors and textures from leading industry brands. Additionally, our affordable prices make it easy for you to find the right type of carpet to fit your aesthetic needs while keeping you on budget. Choosing the right carpeting is made easy with the help from the flooring specialists in our large showroom. Our knowledgeable and helpful staff of experts can guide you through our inventory of premier carpet flooring. We take note of your expectations and provide you with personalized options for you to sample. Rely on us to help you narrow down your search so you can receive the ideal type of flooring to fit your needs in looks, performance, and price. Whether you are searching for durable, plush, or stain-resistant carpeting, it is our goal to ensure you receive the personalized attention and suggestions you need to be confident in your new floor investment. Eliminate the guesswork and stress of installation with our experienced and skilled installers. Our affordable prices help you save money in comparison to having to fix an amateur’s mistakes. Additionally, we can have your new carpet installed in much less time than it would take an inexperienced installer. The industry-grade equipment and skill level required for a new carpet installation make it a daunting task for the average homeowner. A simple mistake can end up causing lifting, ripples, and other issues that turn into visual blunders. Not only that, but also these mistakes can end up voiding warranties and costing more than if you had called a professional to do it in the first place. The beauty of carpeting is that it is aesthetically versatile, yet always comfortable. Our carpets vary in color and a pattern, which means you will always have numerous options to choose from. Our carpet store is owned by a well-known franchise, allowing us the opportunity to provide top-notch training to our employees to ensure they are knowledgeable about various carpet and flooring products. 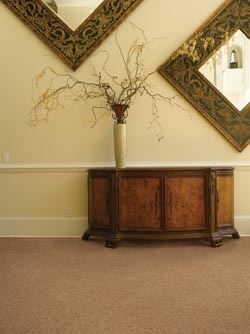 Berber carpet has a special style and cushiony feeling underfoot that is perfect for all types of homes and families. Its unique design consists of yarns that are looped and uncut on the carpet surface. The pile height varies from low and tightly constructed designs to a more opulent, high-level pile. Berber carpet also has phenomenal strength and soil-hiding capabilities, making it an ideal style choice for heavy foot-traffic areas. Furthermore, it can be constructed as a level-loop or multi-loop carpet, depending on your preference. Contact us today to add a unique and versatile style to your home with our carpet flooring. We are proud to serve the communities of Hooksett, Manchester, Goffstown, Bow, and Bedford, New Hampshire, as well as the surrounding areas.